First, a little background! For many years, our contests have been held in the INB-Performing Arts Center (INB-PAC) instead of our actual contracted space, 111ABC, in the Spokane Convention Center. 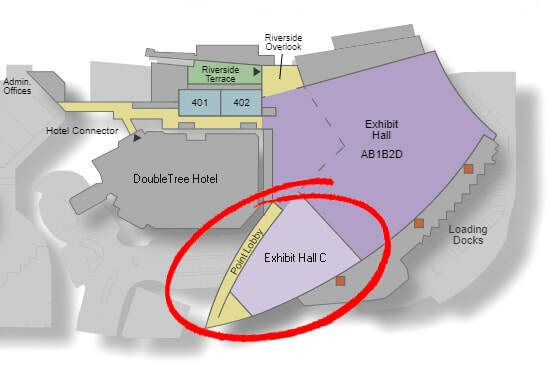 We’ve also had use of the Convention Center's rooms between the DoubleTree and the INB-PAC for our traffic pattern needs. This year, however, we have had to seek an alternate venue as “Dirty Dancing” is scheduled in the INB-PAC during contest weekend and our contracted space (111ABC) is too small to accommodate our contests. Last spring we toured possible spaces for the 2018 convention, and elected to move our contests to Exhibit Hall C in the newer part of the Spokane Convention Center, which you can see on the right. Exhibit Hall C is a very large, open space designed for big events such as conventions and concerts. It has built-in sound and lighting systems and padded chairs, all of which will fit our needs nicely. ​Audience seating will be divided into three sections. There will be carpeting in the aisles and under the judges’ table area. 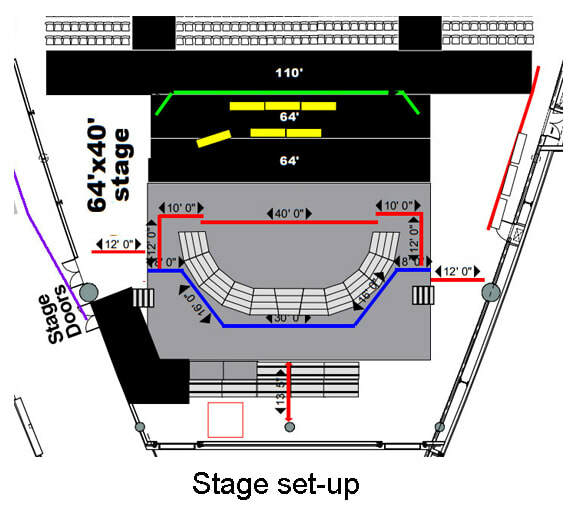 ​The red lines in the Stage Set-up schematic indicate where curtains will be for the quartet contest on Friday. Quartets can enter the stage either from stage right, stage left, or through the middle of the curtain. Following the quartet contest, there will be a short intermission while the stage crew removes the quartet curtains so quartets can use the entire stage and risers for the awards announcements. ​​The blue lines in the Stage Set-up schematic indicate where the main curtains will be placed behind the risers on the stage during the weekend. There will be no curtain in FRONT of choruses on Saturday, so contestants will walk on stage under dimmed lights. DoubleTree Hotel contestants: As we have for the last several years, contestants staying in the DoubleTree Hotel will again use the third floor connector hall to get to the Promenade. This year, however, volunteers will direct you to the right and walk towards the exhibit halls using the ramps or the steps. The check-in table will be in this hall. See photos below. Hotel RL contestants: Hotel RL contestants will be bused from their hotel to the Convention Center parking garage. From there, they will be met at the door (outlined in blue) and escorted upstairs (via steps, an elevator, or escalator) to the Riverside Lobby and the check-in table. Please note: We will have volunteers at each junction to point you in the right direction. 1. Quartets will proceed to the photo room to have their official photos taken. Chorus photos will be taken on stage following each chorus performance (NOTE: This is a change for choruses from previous information!). 2. The warm-up room is a flat floor room (ie: no risers) for both quartets and choruses. 3. Contestants will then walk thru the Riverside Lobby to the Point Lobby door and continue down the hall to the stage doors, dropping personal items on a table in the Point Lobby along the way (red arrows shown in graphic). 4. Contestants will enter backstage from the Point Lobby and walk up a long ramp to the stage. Quartets can select whether to enter from the center of the curtains, stage left, or stage right. Choruses will get onto the risers from stage right and exit stage left. 5. Contestants will exit by walking down the ramp and out the stage door into the Point Lobby, picking up their personal items, and continuing down the hall to the Audience Entrance. Dual members can bring their second costume over to the Convention Center Friday or Saturday morning before 11:00 am and hang them on one of the coat racks near the end of the Point Lobby Hall by the Stage Door. PLEASE CLEARLY AND PROMINENTLY LABEL ALL COSTUME PIECES WITH YOUR NAME. • Some of you will have ample time to get back to your rooms, change, and rejoin your chorus in the traffic pattern. • A curtained space will be available backstage for dual members who need to change immediately into another costume; up to three women can fit here. However, you will need to make sure someone is responsible for taking away all of your things (costume, makeup, etc) from this space after you are dressed so it’s open for the next singers to use. • ​Two multi-stall bathrooms will be available on the ground floor at the bottom of the escalators (in the "point" area) for dual members to change. The rooms will only be accessible from upstairs, so you will need to get your costume right after your first chorus sings. An usher will be posted in that area to keep an eye on the costumes. VERY important to note: Be sure to gather up your costumes, makeup, etc. and take everything to your hotel rooms before you leave the contest. This area will close up and be locked up as soon as the contest is finished (including the promenade to the DoubleTree). The only way to retrieve your possessions later will be to call the Convention Center on Monday.